Only 21% of travelers ranked the mini-bar as an important amenity, compared to 89% who called free in-room wireless Internet the most important. There is little financial reason to keep minibars. Hotel consulting firms estimate that minibars generate no more than 0.24% of total hotel revenue, with much of that eaten up by the cost to check and restock the bars. Companies that build and sell automated minibars that electronically charge guests when a drink or snack is removed from the bar say they can cut the labor costs by up to 60%. 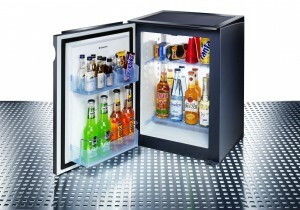 Still, industry experts say minibars won’t be around for long. But the future of minibars is bleak mostly because of social trends that have pushed travelers into the lobbies to socialize and surf the Web instead of sitting alone in their rooms eating minibar food, said David Corsun, director and associate professor at the Knoebel School of Hospitality Management at the University of Denver. It’s the same reason some hotels are eliminating room service and beefing up the food and drink offerings in the lobby, Corsun said. We are still going to miss getting a Coke and bag of M&M’s for only eight thousand dollars! This entry was posted in News & Notes and tagged hotel minibar by TrueGuest. Bookmark the permalink.